Waking up to press reports about the launch of Velon this morning. With a good percentage of the world tour (including Sky) signed up already it’s looking like an attempt by the teams to exert greater control over the way the sport is currently organised. In itself, a greater say for the teams, isn’t an obviously ‘bad’ thing. Some team principals have bemoaned the lack of a transfer system for example that could introduce a vital revenue stream for teams at all levels. Then there’s the race calendar that prevents the world’s best riders competing against each other due to events clashing. A powerful bloc in the sport negotiating to ensure future financial viability could (in theory) transform cycling for the better. Velon – big changes for the peloton? While a transfer system isn’t explicitly mentioned in today’s news story, one of the Velon co-signatories Dave Brailsford is a proponent of team’s receiving a benefit from the movement of riders they have developed elsewhere. VCSE agrees that a reorganisation of how riders move between teams is long overdue. Looking at the UK for example where even successful teams disappear almost overnight for lack of a sponsor, revenue from a transfer (Adam Blyth from NFTO to Orica say) could ensure a smaller teams survival. This has been part of the operating model in football for years. However, there’s a risk that a transfer system within cycling could also lead to some of the same outcomes ‘enjoyed’ within football, with the teams with the biggest budgets snapping up the best riders to the detriment of competition. Sure it’s unlikely that a transfer system would produce a different grand tour winner to the default Contador, Froome or Nibali, but it could result in a dominance among certain teams that (potentially) damages the spectacle. On the whole though if one of the aims of Velon is to instigate a framework that provides teams with another revenue stream besides sponsorship this can only be a good thing. The challenge for Velon is to ensure that the stated aim at the heart of the project; to have ‘fans’ at the ‘centre’ is actually delivered. While there are some obvious beneficial parallels to the introduction of the Premier League (EPL) there are other aspects that cycling shouldn’t be seeking to replicate. For the moment cycling is a relatively accessible sport for someone who wants to start a team, with even some world tour teams able to operate on a budget of just a few million euros. In football, the EPL in particular but also the top leagues in Spain and to a lesser extent Italy require annual investment of hundreds if not billions of dollars. In the case of the EPL much of this money has come from an ever increasing amount of cash from Sky as the main broadcaster of live matches. Over the years as Sky have bid ever more for the TV rights the clubs who have managed to stay in the top flight have become in turns bloated and (yet) increasingly reliant on the moneytrain. While it can be argued that Sky’s involvement has been good for the fans in that it has forced every broadcaster to raise their ‘game’ as far as showing football is concerned, there remains a small but vocal minority who feel that it hasn’t always been for the best. The loss of the ‘traditional’ 3 o’clock kick off and the price of a ticket to a game are just two of the complaints often levelled at the EPL host station and clubs. What does any of this have to do with Velon? The EPL started as a group of football club chairman (who in those days were as likely to be the owner of the club too) getting together to discuss a breakaway league. This was in response to their perceived viewpoint that the terrestial (and free to air) networks weren’t giving them (the clubs) full value for money in what was at the time a nascent live football environment. The launch of the EPL on Sky was certainly sold to fans and viewers as football with the fans at the centre, although it would be harder to make that claim now. On the very day that Velon is announced it might seem cynical to question its aims, particularly as it has the opportunity to make the sport more sustainable for its participants and that can only be a good thing. It will be interesting to see how Velon can operate in the (now) three way space between the UCI and the race organisers. There would appear to be no obvious benefit in holding key early season races like Paris Nice and Tirreno Adriatico at the same time for example, although whether a move to non clashing dates would see riders take part in both races is harder to imagine. Then there’s the question of TV money. Within the UK, cycling is not so mainstream that many races are shown free to air. For the committed cycling fan some kind of subscription to a satellite or cable provider is essential to be able to see the spring classics or each grand tour ‘live’. Long before donning their Velon hats team principals have volunteered that they don’t feel that get enough of the benefits derived from the biggest races by the organisers. It’s difficult to see a ‘turkeys voting for Xmas’ scenario whereby ASO surrenders a share of their earnings from the Tour. Might some of the teams push towards a television model that requires the armchair fan to reach further in their pockets to watch ‘their’ chosen sport? 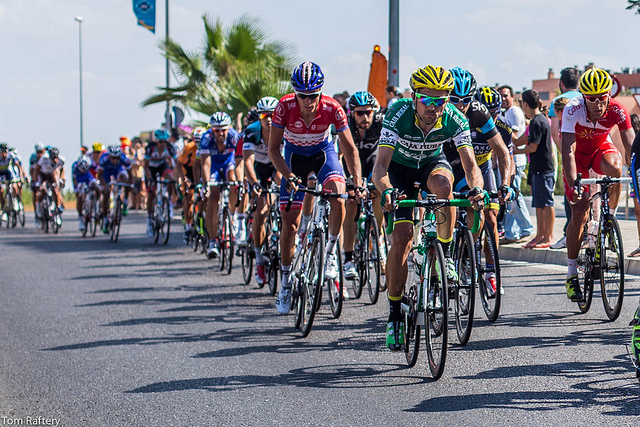 One of the reasons why races like the Vuelta have seen such an increase in support by fans at the roadside in recent years is the fact that cycling is one of the few (if not the only) professional sports that’s free for spectators. It would be good to see Velon enshrine a commitment to having ‘fans at the centre’ that would guarantee that this state continues. Cycling does not need to introduce ticketing into the final kilometre. If Velon can deliver a sustainable model where there’s an incentive for all teams to develop young riders (and while we’re at it a women’s team for every world tour outfit), a racing calendar that avoids date clashes for the biggest races while (at least) retaining the current level of accessibility for fans we should all be celebrating in a few years time. However, it’s so instructive to look at the examples from other sports and perhaps, at least a little, to be careful what we wish for..